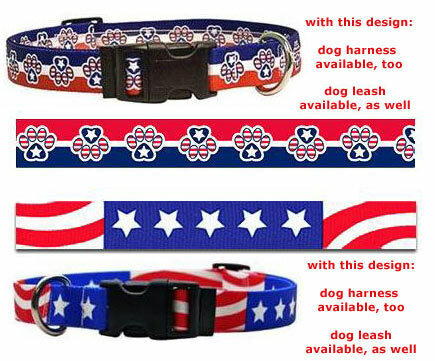 Americana - Dog Harness and/or Leash with the stripes and stars of the American flag. Made of 100% dye-sublimated durable polyester, colorfast and machine washable. The designs are printed with a special heat transfer process onto a heavy braid. Made in the USA. 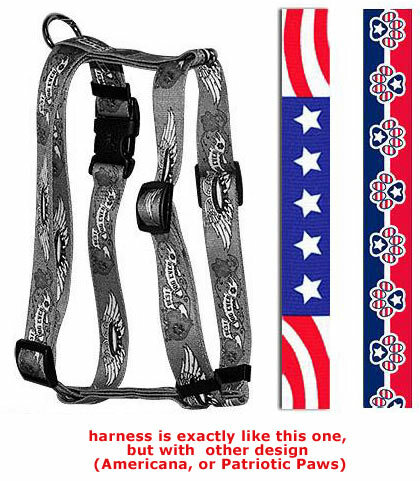 The Stars and Stripes shine bright and proud on this American dog harness! Perfect for those patriotic holidays, or just to show pride any time of the year. Traditional US Flag design, or choose a traditional US Flag design combined with perfect puppy paw prints in a red, white and bluc harness. Combined with a stainless steel d ring for leash attachment. Cool dog gear for American dog breeds, and for patriotic American dog owners! matching dog leash is available, "Americana" or "Patriotic Paw Prints"
yellow dog dog leash, united states, usa, American Flag, patriot, patriotic, American dog breeds, bright colors, multicolor, multi colored, fun, happy dogs, vivid colors, playful, joy, happiness, popping, pop, rocking, rock, cool, trendy, hip, urban, awesome, colorful, beautiful, affordable, pattern, style, stylish, male (masculine, for boy dogs), female (feminine, for girl dogs), matching collar and lead, comfy, pretty, non-leather, design, made in the USA, dog harness and leash set, dog collars and leashes, yellow dog design, braid, adjustable dog collars and leashes, matching harness and lead set, matching leash, matching dog collars, latest fashion, fashionable, decorative, adjustable dog collars, strong, durable, tough, for small dogs, for medium dogs, and for big dogs! To see the matching dog collars, click here! 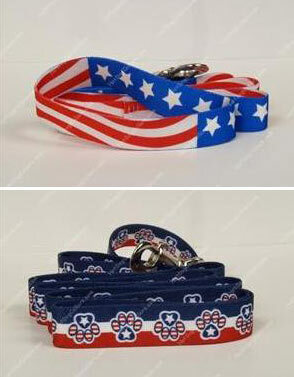 The Patriotic collection by Yellow Dog dog collars, harnesses and leads features the US American Flag. Cool dog gear for American dog breeds, and for patriotic American dog owners! Cloth, machine washable, affordable. Harness, collars, leads, leashes. Section nylon, fabric, cloth dog collars, leads and accessories. Cool dog gear for American dog breeds, and for patriotic American dog owners!